The following review was conducted in June 2017. Zoiper for Android is a VoIP softphone for Android devices, including phones and tablets. Zoiper supports IAX and SIP. It's primed for remote working, and is capable of fully replacing a desk phone. There are two versions of the softphone, a free version and a premium version. The premium (gold) version includes wideband codecs, conferencing, encryption (ZRTP), and call transfer at $8.49. We'll make a distinction between the free and premium version throughout the article. Can Zoiper for Android truly replace a desk phone? And how does it live up to other softphones such as Bria and Grandstream Wave? We performed a comprehensive review to find out. The following review was conducted in April 2010. Since starting our company in 2004, we’ve been dreaming of the day when mobile devices replace desktop phones. Imagine your desk minus the old school desk phone. 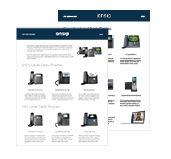 You sit down, remove your cell phone from your pocket, and without doing anything, you are ready to make and receive 4-digit extension calls within your office phone network. The following review was conducted in May 2011. CSIP Simple is a free SIP client for the Android OS. In its current build, the application does not support business features like blind or attended transfer. If you need these features, then I suggest purchasing and downloading Bria for Android. The following review was conducted in April 2011. The following review was conducted in July 2015, and information on subsequent software updates and new version releases may not be reflected within. This review predates OnSIP’s mobile app for iOS and Android, free to OnSIP users, so is not affected by bias. A more recent review of this phone can be found here: Bria for Android (v3.7). Counterpath released an iPhone version of its Bria softphone at the beginning of the summer. It has quickly become one of our favorite VoIP applications in the App Store. The company promised not long after that another version for the Android market would not be far behind, and now—five months later—it’s finally here. How does this new app measure up to existing mobile VoIP apps for Android?